There was plenty of pillow talk amongst customers and partners in John Lewis Watford during October 2006 as an exhibition of pillowcases decorated by artists from across the UK and displayed on beds in the linens department, was opened in the branch. The fifteen pairs and three single pillowcases, which represented the dreams and aspirations of individuals and families arriving in Britain over time, were part of an exhibition called Dream Landings. Here, you can find out more about the project, see images of the pillowcases, and read biographies of the artists. 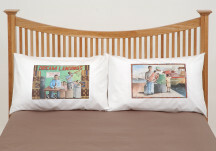 Sweet dreams were on display at John Lewis in October 2006, at an exhibition of decorated pillowcases on the theme of the dreams and aspirations of people arriving in Britain.